"BEAT" IS PERHAPS the last acknowledged poetry movement to create a broad cultural impact on Western society—it's mores, politics, the ways we relate to one another, the ways we relate to ourselves in the mirror. Diane di Prima is one of a few seminal Beat poets. In her first new full-length book of poetry in decades, here is a major poet working at the peak of her powers. Now approaching the end of a writing life, di Prima is taking stock of her ideals, ambitions, of progress achieved and unachieved. Because of the way America adopted and followed the Beat movement in her era, in an important way, the book assumed a dimension of America looking back on itself. Throughout, di Prima reflects on the idealism that brought her from New York, on the social movements of her times, and on the city she has loved and lived and, in her way, led for almost forty years. In this book you find the San Francisco where the young went to be reborn, where a newer-easier-better lifestyle took shape and took hold. For those idealists who have mused about "what happened to the Sixties?" di Prima has an answer. They're alive and well in this book, in di Prima's uncompromising insistence on a sentient future built on sustainable lifestyles. But it's more than that. In principle and in poetry, di Prima is all about people—loved ones, family, social observations of simple interactions that show larger truths. The book is also emblematic of San Francisco in a more specific way, in that it's a publication celebrating her installment as Poet Laureate of San Francisco. The book opens with her Laureate lecture, and this reader's initial reaction illustrates the larger grace of her book and her vision. As a lecture, a discussion about poetry, it seems at first unrealistic as di Prima describes her impossibly high standards for poetry, for society, for all of us. In the lecture, I found myself even scoffing about the realism of these standards for ecology, social responsibility, economy. Then I got to the poems, which meet her idealistic standards in ways that are direct, clear, simple. 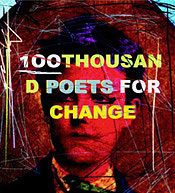 Never vague or ungrounded, the poems are replete with specific touching examples and gentle persuasive images. Ideas spring from observations of the world, rather than words formed to fit concepts. The movement of the reader's mind in reacting to The Poetry Deal is important. What at first seems impossible, wrong, counterintuitive is on reflection seen as an elegant new way of understanding the observable world. This is the sort of movement of mind assocated with genius in science, art, and other disciplines. What at first seems impossible or implausible is subsequently revealed as the most descriptive and accurate vision. 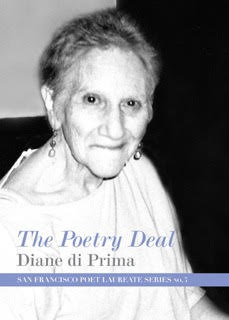 I felt that sort of transition in reading The Poetry Deal and so it seems to me that di Prima has produced a work of genius of the first order. Her vision of human empathy and respect is evolved well past that which dominates in society even today, fifty years after the wholesale adoption of so many Beat cultural mores and values. Much here that may seem heretical to both right and left, and near pathologically independent; one senses she relishes that outsider's view. Still, she manages to be relevant and insightful today in ways that work on the mind long after the book's pages have been closed. was François Villon a Beat? flows thru valleys & over the peaks of the world. the green ice flicker,shrink and disappear. New Zealand. What is to be done? wake us up—as no number will. The influence of Buddhist thought is strong in this book, but in the philosophical sense—and the sense of Beat as a lineage rather than a generation—the strength of The Poetry Deal is not some new philosophy or writing technique. Indeed, di Prima has mastered a wide swath of writing styles: realism, surrealism, haiku, metrical, free verse, projective verse, imagism, and she uses them all here. Rather, it is the intensity and purity of devotion to her muse, to the writing life, to the poem in all its wild beauty and unreasonable demand. This book shows the marks of scars and elevation lived wrestling with what one poet called the life "possessed by genius as kind as a hangman's noose." Her devotion to a life lived for art is something di Prima expresses uniquely well. It is evident in her great prose memoir Recollections of My Life as a Woman, which expresses the appeal of the writing life among memoirs of her contemporaries, capturing its energy and delight, as she lived it in her native New York of the 1940s, '50s, and '60s. Let's hope readers get the second chapter of that great prose work someday soon, describing her life lived in San Francisco. Here, the eponymous poem "The Poetry Deal" expresses the mutual accommodation she has found with her muse, the limits of what it means to be one human living to write and aspiring to approach the infinite. Di Prima has evolved through a full writing life, from the young beauty, to the tough-minded single Mom, always a teacher; one can see from the cover photo she's in a new phase now. She appears to be at the point of reflecting in sum on the devotions of her life—people, movements, ideas, and most of all poetry. She does this with both fierceness and tenderness, resolve and acceptance. She loves her revolutionary hopes for San Francisco of the 1960s and has since made refuge for them to grow, in poetry, art, music, in the eyes of friends and family. If you read this book, as I hope you will, it will stay with you in the mind and heart. It is not easily forgotten, a generous beginning of a future marked by a long line of beginnings, a lineage of love and literature. It is a reminder that those best hopes in all of us can, like the phoenix, touch the sky again. 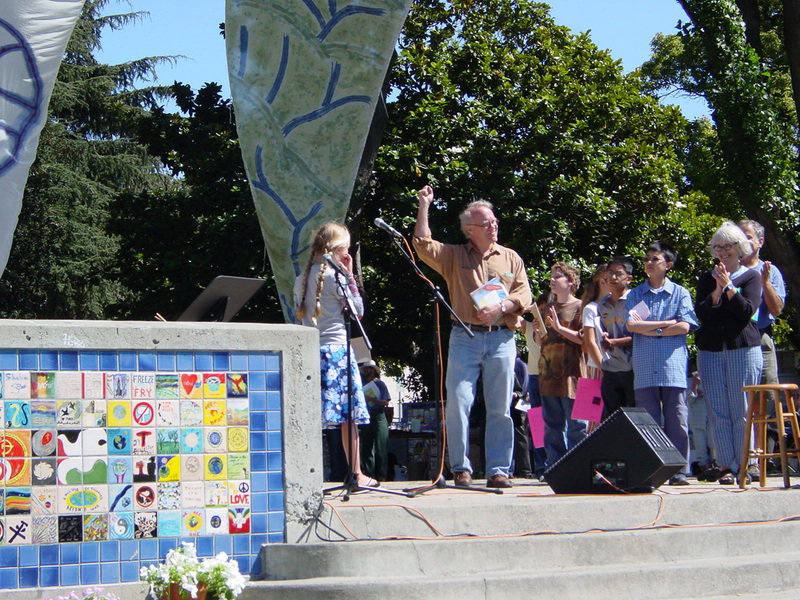 Bruce Isaacson is a poet and publisher who grew up in Oakland. he currently acts as publisher for Zeitgeist Press, a literary collective that has published over sixty full-length poetry collections, many from the 1980s spoken word community around San Francisco's Cafe Babar. He earned degrees at Claremont McKenna, Dartmouth, and Brooklyn College where he submitted an MFA thesis to noted American poet Allen Ginsberg. His own full-length collections are Ghosts Among Neon and Dumbstruck at the Lights in the Sky. His latest book, Frayed, 2014, is available at www.zeitgeist-press.com. He has lived and traveled in New York, L.A., Leningrad, Michoacan, and currently lives in Las Vegas, where he was recently named Poet Laureate of Clark County, Nevada.